This page provides useful information for the design and submission of Microbadges. It should be noted that the approval of microbadges is handled differently depending on the type of badge being submitted. Most, but not all, information shown in this page also applies to RPG and video game microbadges. Please check Where can I find the updated submission rules? further down this page for information on the specific submission guidelines associated with each type of microbadge. How do I make a new microbadge? Use the information on this page to assist in designing, receiving feedback on, and submitting new microbadge designs. What is the current process for submission and approval of microbadges? 4. Use the appropriate thread as detailed here. 6. Submit your new design with the Create Microbadge form. 7. Check microbadge's submission status at the Pending Microbadge Designs list. Who can I contact if I have questions about the process? The best starting point is to submit a question on the Microbadge Submissions, Design, and Feedback thread. What makes a good microbadge? What content is allowed for new microbadges? May I create a non-purchasable, special award microbadge? How do I see what microbadges have already been approved? How do I see what microbadges are pending approval? May I submit a new microbadge for something that already has a microbadge? How do I make a new image for a microbadge? Where can I get help on making a microbadge? Is transparency required for microbadges? How do I give my microbadge a transparent background? Do I need to receive feedback on my design before it is submitted for approval? How do I receive feedback on my design before it is submitted for approval? How do I upload a design for review? How do I display an uploaded design image in a post? How do I display a microbadge (whether approved or pending) in a post? Where can I find the updated submission rules? How do I submit a new design for approval? Who is the microbadge administrator? What am I supposed to put in the "Admin note" on the microbadge submission form? What is a microbadge "Category"? What is a microbadge's "Name", "Grouping Description", "Mouseover" and "Wiki Description"? Are there any guidelines for a microbadge's "Name", "Grouping Description" or "Mouseover"? How do I determine the "Grouping Description" of an existing, related microbadge so that I can match it? How do I check the status of a microbadge submission? How do I determine the reference number for my yet-to-be-approved microbadge? What do I do if I decide I want to change my microbadge image submission or grouping description/name/mouseover before it is approved? How can I delete a microbadge submission? How do I know if/when my microbadge is approved or rejected? How long does it take for a submitted microbadge to get approved? If my microbadge design is approved, do I get a copy of it? How do I suggest or request a new microbadge design? How do I suggest a change to a name, spelling, or categorization for a microbadge that has already been approved? How can I see all of my approved microbadge designs or those of another user? What will happen if/when another user buys one of my microbadge designs? Will I be notified when another user buys one of my microbadge designs? Will I receive a free copy of the microbadge I designed? The image used should be readily recognizable to those who are familiar with the topic that it is depicting. It should strikes a balance between the extremes of sharpness and smoothness. If the image is too sharp, it can appear pixellated; if it is too smooth or blended, it can appear blurry. There should be sufficient contrast to stand out on a small scale. If the background is not pertinent to the subject, then it should have a transparent background. Divisive microbadges (very subjective, but badges that set people at odds at one another). Negative microbadges (e.g. "I hate [subject]") are strongly discouraged. Microbadge designs that could be confused with an existing microbadge are also generally discouraged. Privately awarded badges for Kickstarter and Indiegogo supporters. Privately awarded badges for participating in a thread. Some microbadges have been archived (made unavailable for purchase) after approval due to not being compliant with the above rules and generally not being appropriate. Furthermore, some microbadges have been archived for copyright reasons (Wizards of the Coast does not want their Magic: The Gathering mana symbols used in these manners, so mana symbol microbadges are not allowed). For the full list of archived badges, please refer to the Archived Microbadges wiki page. Certain microbadges exist as special awards for contributions or for specific participation, effort, or involvement inside or outside the Geek websites. These special microbadges are not available for purchase and are either automatically or manually awarded. See more about special microbadges at the main Microbadges wikipage. User-designed special microbadges generally fall into the manually-award category. Due to the high volume of special award microbadges, a would-be designer of a special award microbadge should first find one or more willing site Admins who will help with near- and/or long-term distribution. The would-be designer should also gain permission from the microbadge administrator. When submitting a special award microbadge for approval, include in the "Admin note" on the microbadge submission form a message specifically requesting that the microbadge be non-purchasable. Complete Microbadge List features the complete list of available microbadges; the list can be filtered by microbadge designer. Microbadge Search Page (must be logged in to view) presents a form for searching through the available microbadges. New Microbadges Available for Purchase (and other Microbadge Events) Subscription Thread provides links to the periodic forum threads that showcase the latest approved microbadges. The full list of pending microbadges can be found at the Pending Microbadge Designs page. A new badge for a subject that has already been represented can be allowed if the new submission is sufficiently different, or if it is a significant improvement over existing designs. These types of situations will be evaluated on a case-by-case basis. Crop and resize a desired graphic to 16x16 pixels or draw an image from scratch. Adjust colors, contrast, sizing, masks, individual pixels, transparent pixels, and other elements as desired. A good place to pose questions and receive input is the Microbadge Submissions, Design, and Feedback thread. Microbadge stock images, a wiki page containing some of the most frequently used image parts used in microbadges, such as speech balloons, hexes, hearts, and fonts, that can be used in your designs. Microbadge transparency, a wiki page that describes how to add transparent backgrounds to images using The Gimp. Creating Microbadges - Hints, Help, and How to avoid common mistakes, a helpful geeklist with a lot of detailed explanations for how to deal with commonly encountered issues. Except for special cases, any microbadge image that entails a symbol, emblem, or image on a white background should have the white background pixels replaced with transparent pixels. A microbadge image that fills the entire 16x16 grid with colored pixels, also known as a "square" microbadge, does not require transparency. Note: some designers recommend that even "square" microbadges should have some partial transparency (or in lieu of partial transparency then general lightening) applied to the four corners of the image to reduce the "harshness" of the corners. Different graphics and photo editing software packages handle this differently. A common theme for this software genre are the actions of activating, adding, or turning on transparency or an alpha channel and then using the eraser (or similar) tool to remove the unnecessary white pixels. One relatively simple method using a free open-source image editing program called "The Gimp" is discussed in the Microbadge transparency wiki. If you don't have The Gimp, and are unwilling or unable to download it, consult the Help menu of your individual software package for more information. Yes, every submitted microbadge must undergo a peer-review process. The peer-review is mostly for checking quality and appropriateness of the new badge; your peers will also be eager to provide comments on how the badge might be improved. In order to receive feedback, you should post your new design to the Microbadge Submissions, Design, and Feedback thread, asking for comments. You can, if you desire, include a poll on whether the badge should be accepted or not, or if it needs work. It is highly recommended that you post the complete name, mouseover and category in which the new microbadge is to be placed, along with the image. 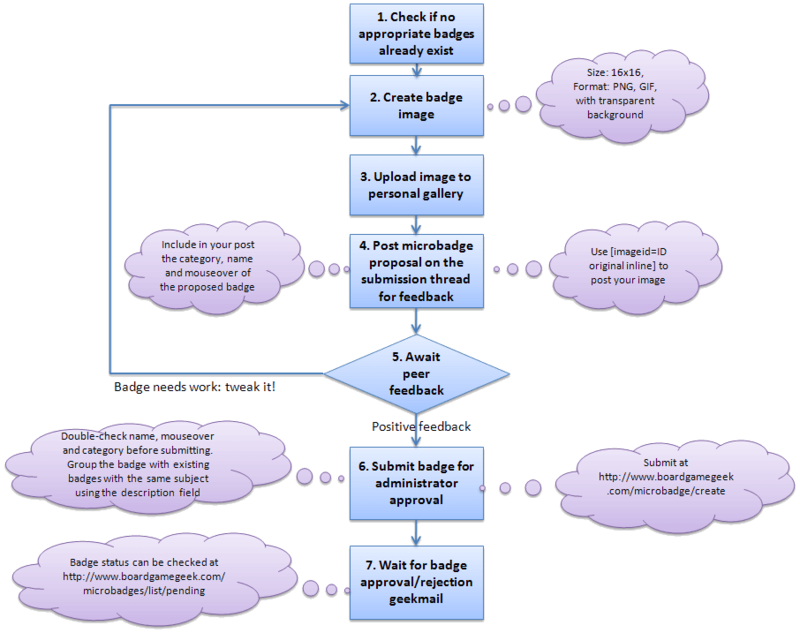 The flowchart shown in the beginning of this page describes all the steps you should perform to receive feedback on your badge. You may upload PNG or GIF (that are the only formats for which image transparency is maintained, and the appropriate microbadge image formats) to your personal image gallery by proceeding to your user profile and selecting the gallery tab. If you have problems uploading with the default uploader, use the Ajax Uploader by clicking on the appropriate link on the image upload page. If you uploaded your image to your BGG user Gallery, visit your user Gallery and obtain the ImageID number of your image by clicking on it. In the post, use this notation: [ImageID=#####] or [ImageID=##### inline]. If you uploaded your image to a different website, use the Insert external image tool. To display a microbadge in a post you should use the microbadge tag, [microbadge=#####], replacing ##### with the microbadge's ID. For example, [microbadge=229] is displayed as . Another method used to display microbadges will permanently display the microbadge name adjacent to the image as a link to the specific microbadge's page. The formatting for this method includes closing coding, such as [microbadge=#####][/microbadge]. For example, [microbadge=229][/microbadge] is displayed as Golden Meeple. When posting on the forum, simply click on the icon and follow the instructions. More information can be found at poll. If you are trying to add a poll to another area of the site that is not a forum post (e.g., to a geeklist item), the poll option is not readily available. In order to add a poll to any such item, you must create a forum post (just click on reply on any post) and click the appropriate button. After creating the poll, your non-submitted forum post should contain a poll tag, such as [poll=1234567890]. Simply copy that text to wherever you want to post the poll and cancel the forum post (i.e., don't submit it). Submit your new design with the Create Microbadge form (after it has gained enough support in the relevant discussion thread). The current microbadge administrator is cscottk. The administrator has the final word in regards to all microbadge approvals and also performs all microbadge recategorizations and other similar tasks. In the past the microbadge administrator role was filled by Lajos and jgrundy. Since the launch of RPGG and VGG, there are specific administrators for RPG and video game microbadges, currently those administrators are Kattvippa (RPGG) and cscottk (VGG). wavemotion administered RPGG's microbadges since the site's launch until 2016. yohanleafheart administered VGG's microbadges for a brief period after the site's launch. You must provide the link to the post in the Microbadge Submissions, Design, and Feedback thread in which you submitted the microbadge for peer review. You may also provide any further information you deem necessary. In most or all web browsers, you may simply right-click on that link and chose the "Copy Link Address" option (wording may vary), after which you can paste the address into the Admin Note field. If the microbadge has been pre-approved to be a special award (non-purchasable) microbadge, include in the "Admin note" a reminder statement that the microbadge should be non-purchasable. Microbadges are organized in categories (and possibly sub-categories) according to what they depict. For example, an Agricola fan microbadge should be placed in category Games, sub-category A. The full list of categories and sub-categories can be found at the Microbadge Search Page. Correctly assigning a microbadge to a category/sub-category pair is of the utmost importance; with improper categorization the microbadge is likelier to go unnoticed. Although many categories already exist, there might be the need of creating new categories. You can request that the microbadge administrator creates the new category when submitting a new microbadge design in the Admin Notes field. If you do so, please make sure the new category is actually needed and makes sense. Name, is the microbadge's name (! ), usually describing what the microbadge represents. Grouping Description, represents another microbadge organization level. Besides being organized in categories (and possibly sub-categories), microbadges are also grouped together with all microbadges that contain exactly the same grouping description (they must also reside in the same category and sub-category, if applicable). When viewing a microbadge's page, all other badges with the same grouping description are also shown. Microbadges with the same grouping description can be viewed of as different representations on the same subject (e.g., different images of a specific game). Mouseover, is the text shown when the mouse cursor is placed over it. When viewing a microbadge's page, if no mouseover is indicated, it means that the "Name" field is used as its mouseover. That is in fact the most usual case, as most microbadges do not have mouseovers that are different from their names. Wiki Description, is an optional field used to provide more information on the microbadge. This field is wiki enabled, so Wiki Formatting formatting applies, and is visible on each microbadge's individual page (i.e., when microbadges are clicked). Furthermore, as it is a wiki type field, it is editable by any user at any time. The following table shows an example of three badges that are grouped together, as they all possess the same grouping description field. One of them has a specific mouseover, whereas the other two simply use the default mouseover (the microbadge's name). The following table shows another example. In this case, two microbadges are represented with the same grouping description, so those two are grouped together. Although the name of the first one is not simply "Agricola fan", its mouseover has been set to just that. The third microbadge is not grouped with other two as its grouping description is different. It should be noted that organizing microbadges via the grouping description field is not clearly defined and inconsistent throughout the database. In the examples above, the Oscar the Grouch fan microbadges have the same grouping description as other Sesame Street microbadges, whereas the I pimped Agricola microbadge is not paired with the other regular Agricola fan microbadges. Common sense, above all else, should be used. No, not really, although trying to maintain some consistency with existing badges is desired. A large percentage of the existing badges have their name, grouping description and mouseover fields set to something fan (such as Oscar the Grouch fan or Agricola fan). For new badges, and in most cases, the something fan structure should be followed. The best way to define a new microbadge's name and grouping description is to search for similar existing badges. For example, all drinker microbadges are something drinker (Coffee drinker, Gin and Tonic drinker, etc), and all country badges I love country (I love Australia, I love Zimbabwe, etc), so new microbadges should try and maintain that structure. If you are unsure, request help in the Microbadge Submissions, Design, and Feedback thread. If microbadges already exist for a given subject, the new badge should be paired up with the existing ones using the grouping description field (besides obviously being placed in the same category/sub-category). For example, if a new Agricola microbadge is submitted, its grouping description should be Agricola fan. Note that the text string is limited to 256 characters for a microbadge's Mouseover and to 64 characters for a microbadge's Name. The "Grouping Description" for an existing microbadge can be found on the microbadge's webpage. To visit the microbadge's page, click on the microbadge. Adjacent to the creator information, there are headings for "Name," "Group," and "Num Owners." At the bottom of the "Group" section in black letters is the "Grouping Description" for the microbadge. In many cases the microbadge "Grouping Descriptions" are the same as the microbadge name. After submitting a new design, you can see if other microbadges are grouped with it by looking at the submitted microbadge's entry at Pending Microbadge Designs list. Go to Pending Microbadge Designs and scroll through the list, or manually go to http://geekdo.com/microbadge/#####. You can do it in exactly the same manner as for already approved microbadges. If you search through the Pending Microbadge Designs list, you should find your microbadge in the pending queue. When the mouse cursor is placed on a microbadge's image, your web browser should display the link that will be followed when you click on it. Alternatively, you may simply click on a microbadge and get the url of the page that was opened. The microbadge's url contains its reference number at the end of it. For example, links to http://www.boardgamegeek.com/microbadge/229. 's reference number is 229. (due to the increasing number of geekdo websites, the address might contain a different domain name, such as www.geekdo.com, but the /microbadge/##### part will always be the same). If you wish to change any part of your pending microbadge submission, you should remove it from the pending microbadge queue and resubmit it with the necessary changes. Please read the following entry for more information on removing a pending submission. The Wiki Description field is editable even when the microbadge has yet to be approved, by clicking on it and selecting the edit option. If the microbadge has not yet been approved, you should locate the microbadge in question on the Pending Microbadge Designs page and click the Remove your own submission link that you can find there. If the microbadge has already been approved, you should contact the microbadge administrator directly with your request. When a microbadge is approved or rejected, a geekmail is sent to the microbadge's designer notifying him/her of the microbadge's status change. There is no pre-determined time period for microbadge approval, it can take anywhere between a few minutes to a couple of weeks. When a microbadge is approved (or rejected), the badge's creator will receive a geekmail informing him/her of that occurence, so designers need only be patient. No, microbadge designers are not given a copy of their badges; they must purchase them like any other user. Designers are rewarded with 0.25 GeekGold for each sale of one of their microbadge designs. You may request a new microbadge in the Microbadge Request & Design Feedback Geeklist - 5th edition [CLOSED] geeklist. In order to request a change to an existing microbadge, please post details of the appropriate change in the Fixes and Clean-up for Existing Microbadges thread. You can enter the user's username in the appropriate textbox at the Complete Microbadge List page to see the list of microbadges created by that user. Microbadge designers are rewarded with 0.25 GeekGold for each sale of one of their microbadge designs. No other awards are given, nor are microbadge designers entitled to their own creations (if they wish, they must buy their own microbadges just like any other user). No, notification of microbadge sales do not exist. You can check your sales in your collected GeekGold page, which can be accessed via your profile, Geekstuff tab, Collected GeekGold option. No. You will still receive the .25 GeekGold commission, however, which will be a rebate of sorts. Therefore purchasing a badge of your own design only effectively costs 7.75 GeekGold. In forum posts, you can also add the text inline with SPACES to place images next to each other horizontally or inline with text. That is normal, as the process is in no way automated and must be performed manually (if the microbadge designer or any other user so desires, as it is not a mandatory action). References to game microbadges should be added to the "More Information" section of games' pages. To add your microbadge to the game's page, simply edit the "More Information" section and add references to the appropriate badge(s). It should go without saying that you should add all applicable microbadges to the appropriate section of a given database item, not just the one(s) you designed for it. The above example includes a small header (linking to the Microbadge wiki entry, and the list of badges available for the game. The badges' IDs (written twice for each badge) and the badges' name must be specified.